You save $3.00 — $6.00 (22% — 30%)! 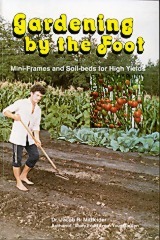 This book masterfully teaches the Mittleider Method of container or Grow-Box gardening using hundreds of pictures. This book masterfully teaches the Mittleider Method of container or Grow-Box gardening using hundreds of pictures. It is an excellent step-by-step guide to raising great quantities of tasty and healthy vegetables in small areas using containers of any size. Many years of world-wide research and demonstration have created these scientific techniques for super-intensive food production. Applies to large and small gardens. Great gardens can be produced on any terrain, on patios, driveways, or even flat roof-tops – in any climate, and in any soil. Download Chapter 3: What are Mini Grow-Boxes? (PDF, 560 KB) and learn what grow-boxes are and how to assemble them.